St. Paul, Minnesota (January 23, 2018) – The NFL Sanctioned Super Bowl Gospel Celebration (SBGC) will kick-off Super Bowl 52 with its 19th Annual star-studded music jubilation live taping on a new day, Thursday, February 1, 2018, at the Benson Great Hall at Bethel University in St. Paul, Minnesota. The annual event joins together key NFL Players, top Gospel/Contemporary Christian and mainstream GRAMMY® Award-winning artists and special guests all on one stage to bring audiences an evening of uplifting music and inspirational messages. The 1-hr special will air on the BET for the fifth consecutive year on Saturday, February 3rd, 2018 at 11:00 p.m. ET. Tickets are available for purchase through TicketMaster.com. In the first live performance off of his forthcoming Gospel album release, Snoop Dogg Presents the Bible Of Love, GRAMMY® Award-nominated, American Music Award® winning, platinum-selling rapper and songwriter Snoop Dogg has been announced to perform. As an entertainment icon and one of the most important figureheads in music, Bible of Love represents Snoop Dogg's highly anticipated venture into inspirational music. As part of his exclusive performance, he has assembled an all-star ensemble of artists that will join him on stage in this electric live introduction to the Bible Of Love featuring GRAMMY® Award-winning hip hop and R&B singer Faith Evans, GRAMMY® Award-winning gospel singer Tye Tribbett, GRAMMY® Award-winning gospel vocal group The Clark Sisters and GRAMMY® Award-nominated gospel musician Rance Allen. 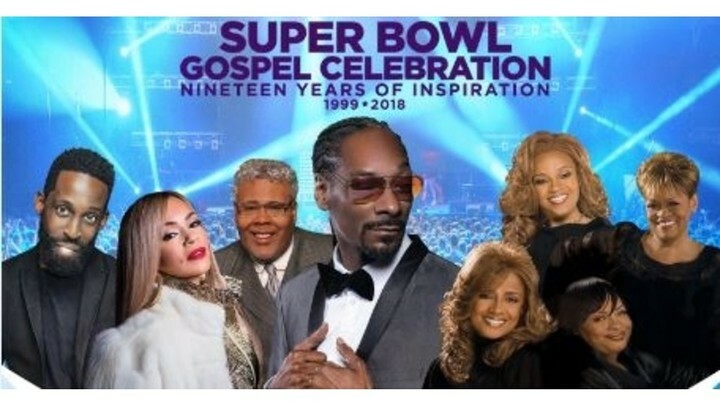 Performers at this year’s Super Bowl Gospel Celebration also include Christian and R&B singer Erica Campbell, GRAMMY® Award-nominated percussionist and singer Sheila E., GRAMMY® Award-winning gospel singer Donnie McClurkin and GRAMMY® Award-winning vocal and instrumental ensemble Sounds of Blackness. This year’s concert will be hosted by NAACP Image Award®-nominated actress from HBO’s hit show Insecure Yvonne Orji, and gospel singer and star the OWN Network show The Book of John Gray Pastor John Gray. Special honors will be presented during this year’s show, which include the first-ever Faith in Action Award honoring Seattle Seahawks’ Russell Wilson, and Arizona Cardinals’ Larry Fitzgerald receiving the Lifetime of Inspiration Award. Celebrating their 10-year anniversary will be the NFL Players Choir, which features 40 current and former NFL players. The choir has become one of the most anticipated performances during Super Bowl Weekend. Musical Director Myron Butler will also be returning this year to lead the choir. BET Networks, a subsidiary of Viacom Inc. (NASDAQ: VIA, VIA.B ), is the nation's leading provider of quality entertainment, music, news and public affairs television programming for the African-American audience. The primary BET channel is in nearly 85 million households and can be seen in the United States, Canada, the Caribbean, the United Kingdom, sub-Saharan Africa and France. BET is the dominant African-American consumer brand with a diverse group of business extensions including BET.com, a leading Internet destination for Black entertainment, music, culture, and news; BET HER (formerly CENTRIC), a 24-hour entertainment network targeting the African-American woman; BET Music Networks - BET Jams, BET Soul and BET Gospel; BET Home Entertainment; BET Live, BET’s growing festival business; BET Mobile, which provides ringtones, games and video content for wireless devices; and BET International, which operates BET Networks around the globe.